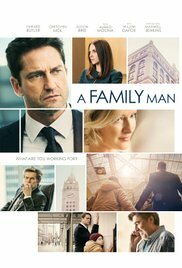 “A family man” is about a headhunter whose life revolves around closing deals in a a survival-of-the-fittest boiler room, battles his top rival for control of their job placement company — his dream of owning the company clashing with the needs of his family. In “Olympus has fallen” and “London has fallen” Gerard Butler took care of the president of America and fought against a whole battalion of terrorists. In “A family man” Dane Jensen (Gerard Butler) has to fight other demons. On the one hand there’s his hectic and energy-hungry job as headhunter. A job he lives for and that keeps him occupied for at least 70 hours a week without exception. And on the other hand there’s his charming wife Elise (Gretchen Mol), his son Ryan (Max Jenkins) and daughter Lauren (Julia Butters). A warm family that never lacks anything thanks to Dane’s efforts. On a materialistic level that is. Because each and every one of them craves for the presence of a husband and a father figure. Dane may be physically present but in reality he’s always busy with his work. This results in displeasure and frustration. Dan always acts like a businessman. When Ryan seems to gain weight, he reacts pragmatically. He just gets up at an inhuman hour to go jogging with his son. Yep, it’s again about that dreadfull disease. The psychological pressure increases when Dane’s boss Ed Blackridge (Willem Dafoe) announces that he’s thinking of a well-deserved retirement and passes on his position to the person who can present the best annual figures. You don’t have to be a Nostradamus to predict what effect this has on Dan. And then it turns out that Ryan’s overweight is not because of playing “Assassin’s creed” for hours while enjoying loads of snacks. It’s a swollen spleen due to a severe form of leukemia that causes his waistline to increase. Most viewers (including myself) will start rolling their eyes and shake their heads. Not again another sentimental story with that horrible disease as a central theme and the inner conflict certain people will feel. In this case it’s Dan who has to find the right balance between his competitive job and the welfare of his son. And he comes to the realization that no compromises can be made or illegal tricks can be used in such a way that the aggravation of the disease can be avoided. The message is crystal clear after a while. The whole karma and “What goes around comes around” principle is really emphatically emphasized. It’s all about that moment when you realize that you shouldn’t take everything for granted and you start realizing what’s really important in life. I wouldn’t be surprised if Dan decided to convert to the monotheistic religion of the Sikhs and move to India to live there as righteous Punjab. The transformation from unscrupulous, senseless workaholic into an insightful family man whose priorities suddenly changed completely, was enormously predictable. But despite that predictability and cheesiness, I couldn’t resist to look at the rest of this über-emotional tearjerker. In terms of content it was perhaps very syrupy sweet and not very original. But in terms of interpretation I can only respect Gerard Butler whose acting-past is richly filled with action-rich roles where an elaborated character wasn’t really required. As King Leonidas in “300” and Mike Banning in “London / Olympus has fallen” he only had to be fearless, ruthless and determined. So no complex feelings and character traits. The implausible wasn’t due to his acting performance, but due to a reasonably weak script. The most eye-catching and praiseworthy acting is for Max Jenkins who, despite his young age, delivers an admirable performance. Ryan was portrayed realistically by this young boy. The rest of the cast took care of the no less important roles, but they weren’t not so explicitly in the spotlight. Gretchen Mol as the disgruntled wife (but on the other hand she was in a privileged position thanks to the well-payed job of her husband). Alison Brie, the ravishing rival of Dan. Willem Dafoe as the single, tyrannical CEO whose life was only focused on making loads of money. And Alfred Molino in a modest role as an unemployed engineer at age, who only serves as a toy in Dan’s head hunter’s game. Shoes aren’t tasty. I know that now ! I am not a hypersensitive type or over-sentimental, but when a drama with this kind of subject doesn’t not touch me or moves me, then something is wrong. Either it’s totally unbelievable or it’s so predictable. I’m afraid the movie just follows a well-known path without deviating, so that it has little interesting to offer. Towards the end, I said to my wife: “If that little boy wakes up now, I’ll eat my shoe.“ Never knew that shoe soles were so chewy.